My pop up Post-it dispenser has failed to produce a new note. Not sure where to go from here. Maybe I could work with the elderly, like in a nursing home or something. But those old people can get mean. And sometimes even regular people have trouble hearing me, so imagine an old person. They'd probably get mad that they couldn't hear me and then they'd get MEAN. Just shook several crumbs out of my keyboard: 2 Kit-Kat or Nestle Crunch, 6 whole wheat or similarly grained bread, and 3-4 flavor blasted cheddar cheese Goldfish. In five days I can change my desk calendar to September. It'll be nice to look at a new month of blank squares. I asked the Fed Ex guy if he had any extra shipping supplies on his truck, but he said he usually doesn't carry extras. My boss came by my desk this morning with two extra tickets to tonight's game. It's too bad that none of the other managers he asked me to email could go either. 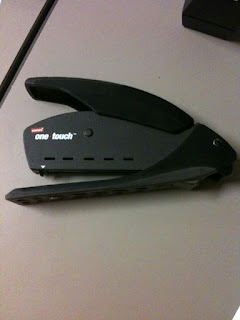 My three hole punch has become engorged with 1/4 inch paper circles. I emptied the circles into my waste basket so that the next time I need to fasten pages into a binder I will be able to do so without delay. I've always liked books and sometimes thought about becoming a librarian. But really, who uses libraries anymore? Strike three. I may need to use the heavy duty stapler. A Fed Ex package came in today that wasn't addressed to anybody's attention. There was quite a bit of confusion until we figured out who it belonged to and put it on his desk. While doing some filing this afternoon I noticed a few folders had been re-filed incorrectly. I returned these folders to their correct places so that alphabetical order would be restored to the cabinet. A few minutes later the same situation arose in another drawer! Ah bittersweet irony. The new Uni-ball Signo RT Gels came in today. I put a few in my pencil cup to enjoy right away, and one in my drawer for after lunch. We're down to our last box of second page letterhead. If we run out I may have to fit my letters onto one page. This may be difficult depending on the length of the letter that I've typed. A red light came on alerting me that my printer was out of paper. I refilled it so that the light would go out and I could continue to print documents. Our building is having an "ice cream social" today. It'll be nice to stand in the lobby for a few minutes. My boss's haircut needs to be rescheduled to Friday. I'm keeping my fingers crossed on availability. My boss asked me to pull him a file that's usually pretty hard to find. This time it was right where it's supposed to be. There were some leftover sandwiches after a meeting today: two roast beef, one ham, one chicken or possibly tuna salad, and half a tub of mayonnaise. I moved them into the kitchen and sent an email to the office so that they would know about the sandwiches. I think I would like teaching, except children don't listen to me. And then you have to meet with the parents who wouldn't take me seriously. Weekends are a time for pondering my other options. Mapping out my future, if you will. I can't be a doctor because I'm already 30 and med school takes like 10 years. I noticed that some papers I thought I threw away yesterday were laying next to the trash can. I picked them up and added them to today's collection instead. So goes life. I accidentally spilled water on my surge protector this morning. Nothing happened.